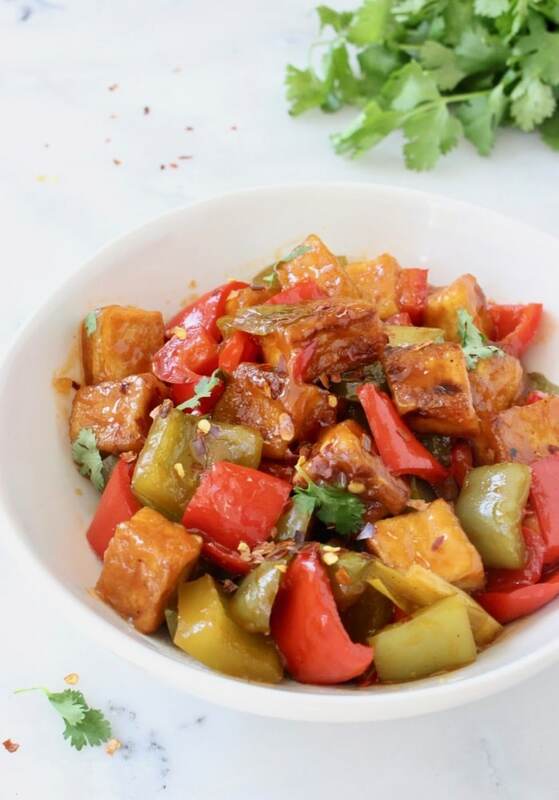 Vegan Sweet and Sour Tofu, a super tasty and simple Thai dish made with crispy pan seared or “air fried” tofu cubes that are finished in a luscious sweet and sour sauce and vegetables. Perfect served with a bowl of rice or tossed with your favorite noodles. I started by sautéing some bell peppers and scallions I had in the fridge (broccoli florets would be amazing here too) then added the sauce and finally the pan seared / air fried tofu to absorb as much of that goodness as possible. You can seriously forget about greasy take-out with this delicious quick tofu recipe in your back pocket. A high plant protein food made using soy curd that is pressed into white blocks. 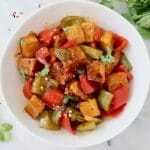 It is low in calories with neutral flavor and ideal texture for soaking up whatever flavor you want to give it. It can be soft, firm or extra firm. It’s very important that you first press the tofu and remove as much of the water content as possible. Use a tofu press like this one or follow the basic instructions below. Remove the tofu from its package and pat it dry very well with a dish towel or paper towels. Line a plate with a few paper towels and place the tofu on top. Cover with a few more paper towels. Alternatively just wrap the tofu in a cotton tea towel to save the trees. Place a heavy skillet or pot on top of the tofu. Once pressed cut the tofu into cubes and use the tea towel to pat dry any remaining moisture. At this point you want to dust the cubes with tapioca flour and toss them to coat well. Meanwhile you heat up a cast iron skillet to which you add just enough oil to coat the bottom so nothing sticks. 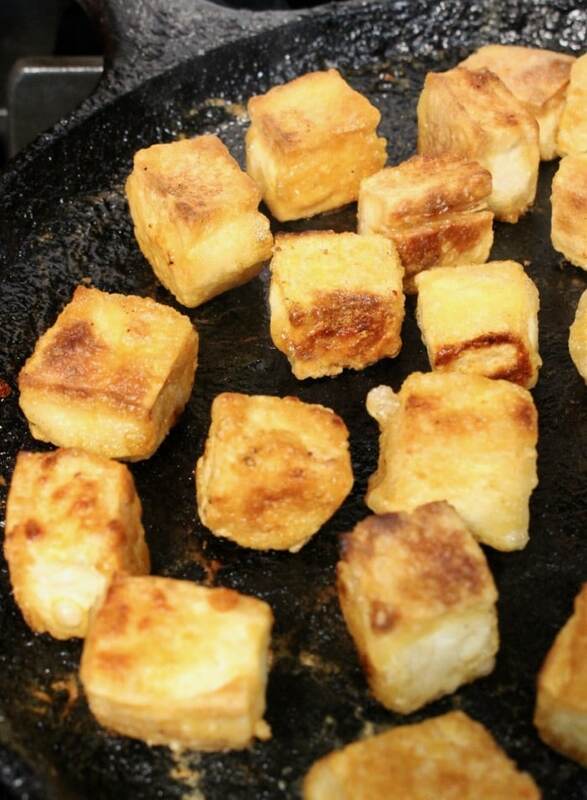 Pan sear the tofu cubes until golden on all sides and toss with your sauce. Better yet: air fry the tofu for 15 minutes for a healthy WFPB no oil alternative. Follow the exact recipe below, only instead of pan searing the tofu you are going to bake it at 400”F on a parchment lined baking sheet for about 25 minutes (or until golden) tossing it half way. Meanwhile prepare the sauce and toss everything together. 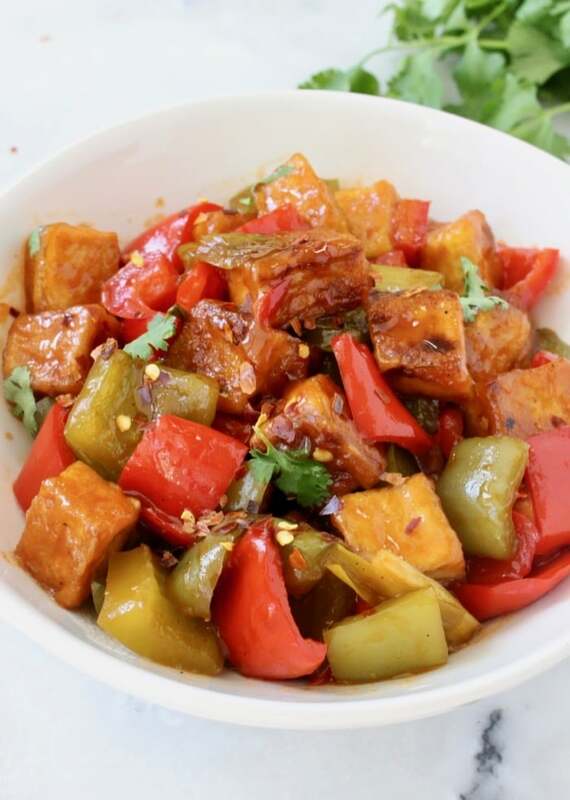 Tofu is a fantastic source of protein and contains all eight essential amino acids. An excellent nutritious food with way more benefits than just its protein content. Make sure to only purchase organic and non-gmo. 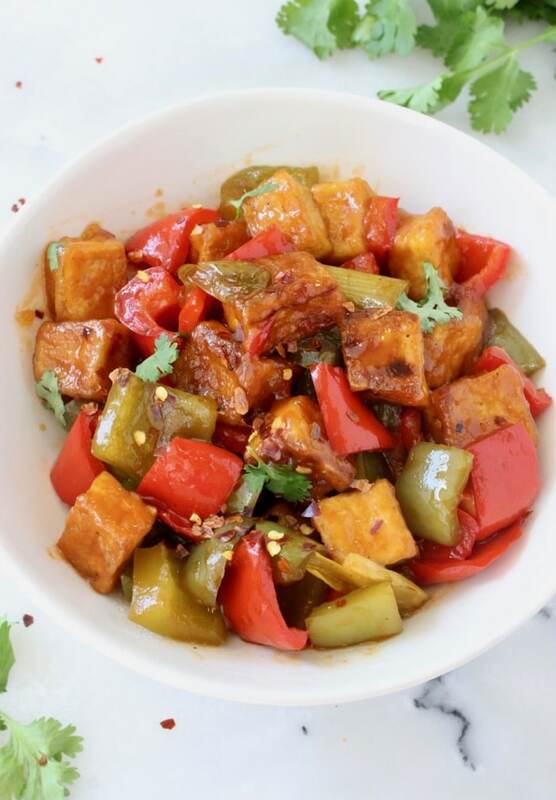 Vegan Sweet and Sour Tofu, a super tasty and simple Thai dish made with crispy pan seared tofu cubes that are finished in a luscious sweet and sour sauce and vegetables. Try to drain and press the tofu in advance. Use a cotton tea towel to pat it dry as best as you can. Slice it lengthwise and pat dry again. Continue cutting the tofu into small cubes and pat them dry some more. If prepping tofu in advance you can place it in the fridge at this point and allow to air dry overnight. This step will really help your tofu get extra crispy. Just before cooking dust the tofu cubes with the tapioca and use your hands to toss it well to coat all over. Preheat a large cast iron skillet over medium flame and add a drop of olive oil, enough to coat the entire bottom. Start adding the tofu cubes and pan sear on all sides until golden. Transfer to a bowl until needed. Make sure to work in batches so you don’t overcrowd the pan. Meanwhile preheat a large skillet over medium flame or follow the Air Fryer method below. Cut the bell peppers and scallions into one inch pieces, discard the core from the peppers. Add all of the sauce ingredient to a bowl and whisk them together. Set aside. Add the peppers and scallions to the skillet together with a splash of water and pinch of sea salt. Saute a few minutes until the peppers just begin to soften. 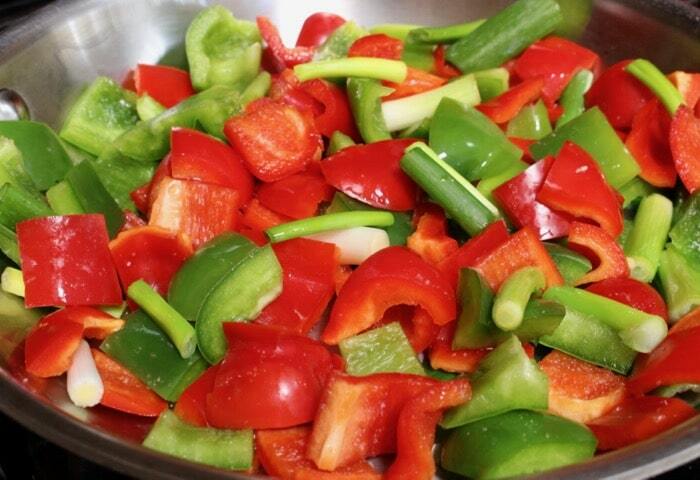 Pour the sauce over the peppers and bring to a simmer. Add the tofu and give it a good stir. Cook everything together until the sauce starts to thicken and tofu is nicely coated all over. Serve hot over a bed of rice or tossed with soba or ramen noodles. After pressing the tofu and tossing it in the tapioca place it on a parchment lined baking sheet or air fryer basket. Air fry at 400"F for 14 minutes flipping it half way. Add it to the pan with the sauce and vegetables and cook everything together until the sauce starts to thicken and tofu is nicely coated all over. Enjoy! I made this today. Outragious! ! ! Delicious! ! ! This recipe is a keeper. I add a carrot, just because I had one and I like carrots. WOW! ! ! sooooooooooooo good. Woohoo, I know that feeling, this is our favorite tofu dish too. 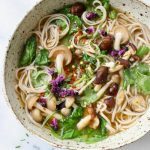 I tossed it with a spelt ramen last time and I simply couldn’t have made enough. 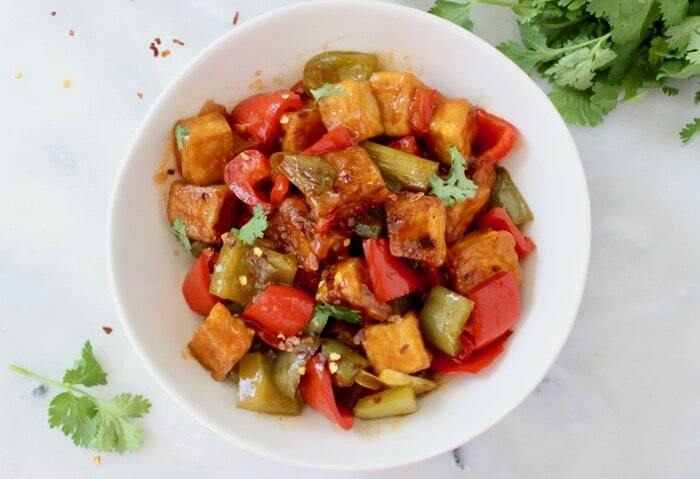 Would you please send me this sweet & sour tofu recipe in an email, it looks wonderful! I had some fresh pineapple in the fridge so I decided to add it to this as suggested and let me tell you that is the greatest idea ever! By far the best tofu I’ve ever eaten, I have a newfound appreciation and love for it.